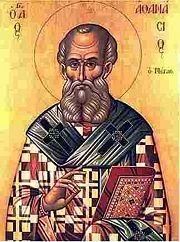 Athanasian was born around 296 AD and died 373 AD. He was a speaker at the First Council of Nicaea where Roman Emperor Constantine attended along with all the church leaders of the time. He was a foundational teacher about the Person of Jesus and The Trinity. His creed directly address The Trinity and other areas that the church in that time was having a hard time trying to understand and explain.